सभी मङ्गलमय घटनाओं के साक्षी बनें औरकिसी को भी दुःख का भागी न बनना पड़े।"
Welcome to BNYSM India (BCAM India) BCAM is expanding ..
Naturopathy & Yoga is an ancient Indian System of treatment. Therapies used under this system are- Yoga, Acupressure, Reflexology, Hydrotherapy, Mud therapy, Magneto therapy, Massage therapy, Fasting Therapy, Chromo therapy, Nutrition as well as Diet & Life style counseling. We are thinking beyond conventional boundaries – endeavors to create an environment that promotes learning, while nurturing professional and personal growth of Naturopathy and Yoga students, teachers and professionals. A most dependable, dedicated, informative, updated, well planned website that serves as credible platform for exchange of information among Complementary and Alternative Medicine fraternity. Our aim is to create competent & confident Naturopathy and Yog Experts by providing quality teaching and learning materials. Our meritorious service by providing precise, self-sufficient & up to date study materials to aspirants of competitive exams,career and placement is unparalleled – that packed with genuine stuff. 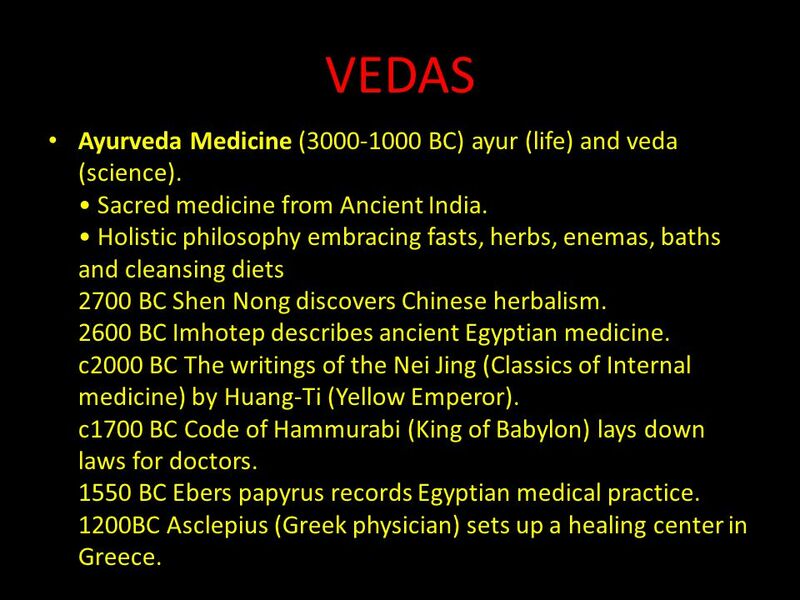 2 VEDASAyurveda Medicine ( BC) ayur (life) and veda (science). 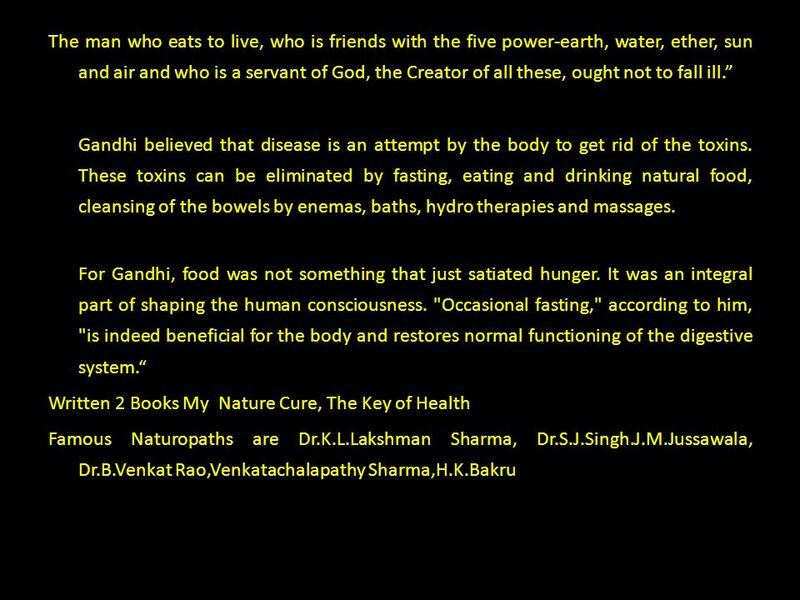 • Sacred medicine from Ancient India. • Holistic philosophy embracing fasts, herbs, enemas, baths and cleansing diets 2700 BC Shen Nong discovers Chinese herbalism BC Imhotep describes ancient Egyptian medicine. c2000 BC The writings of the Nei Jing (Classics of Internal medicine) by Huang-Ti (Yellow Emperor). c1700 BC Code of Hammurabi (King of Babylon) lays down laws for doctors BC Ebers papyrus records Egyptian medical practice. 1200BC Asclepius (Greek physician) sets up a healing center in Greece. 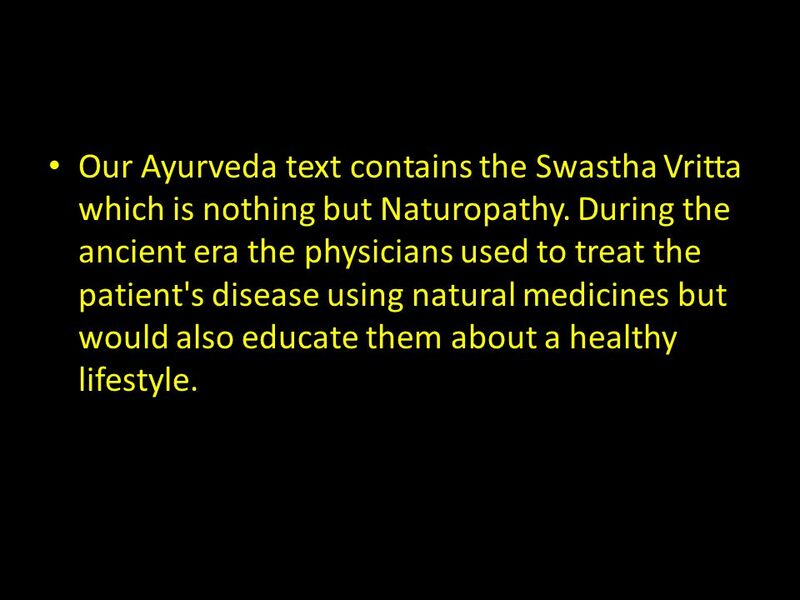 3 Our Ayurveda text contains the Swastha Vritta which is nothing but Naturopathy. 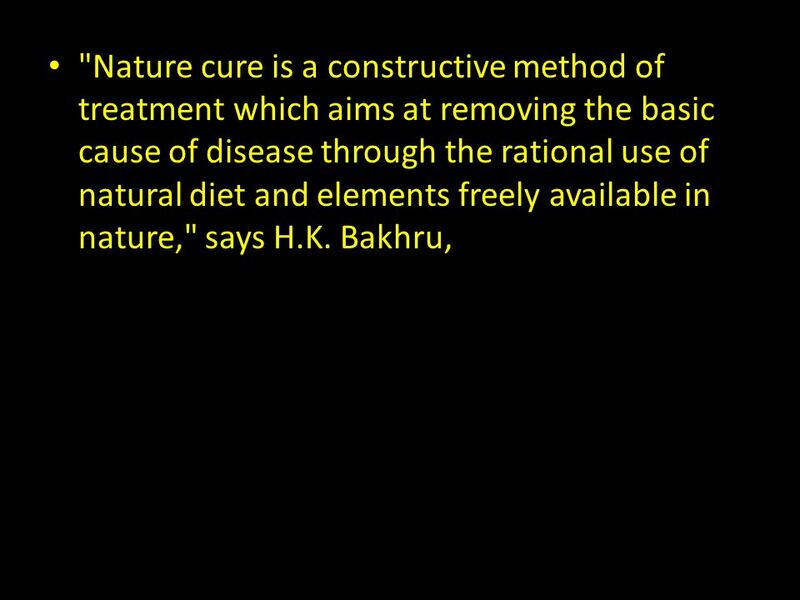 During the ancient era the physicians used to treat the patient's disease using natural medicines but would also educate them about a healthy lifestyle. 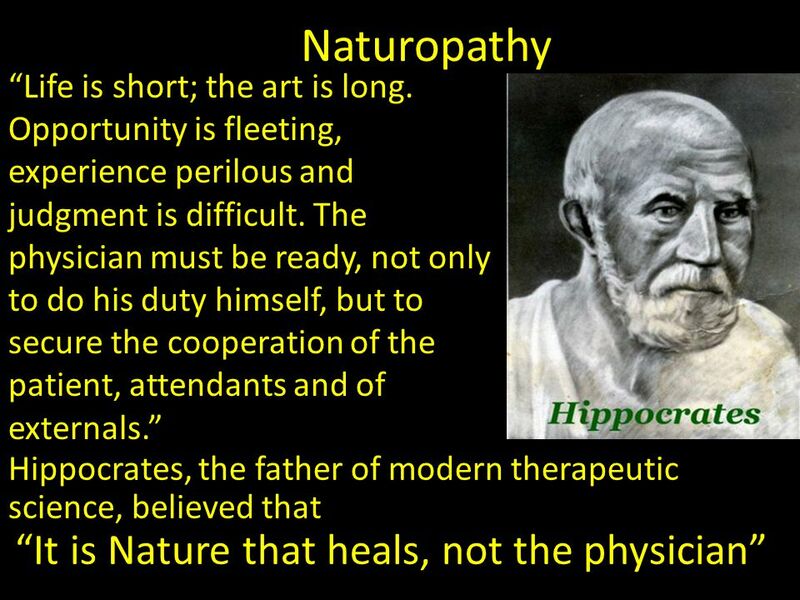 HIPPOCRATES ( BC) The father of medicine. 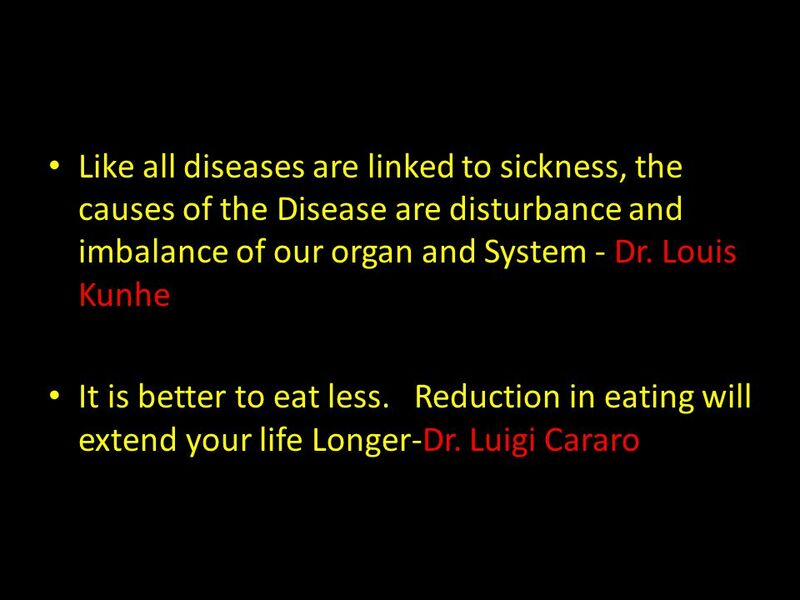 “Let food be thy medicine and medicine be thy food”. 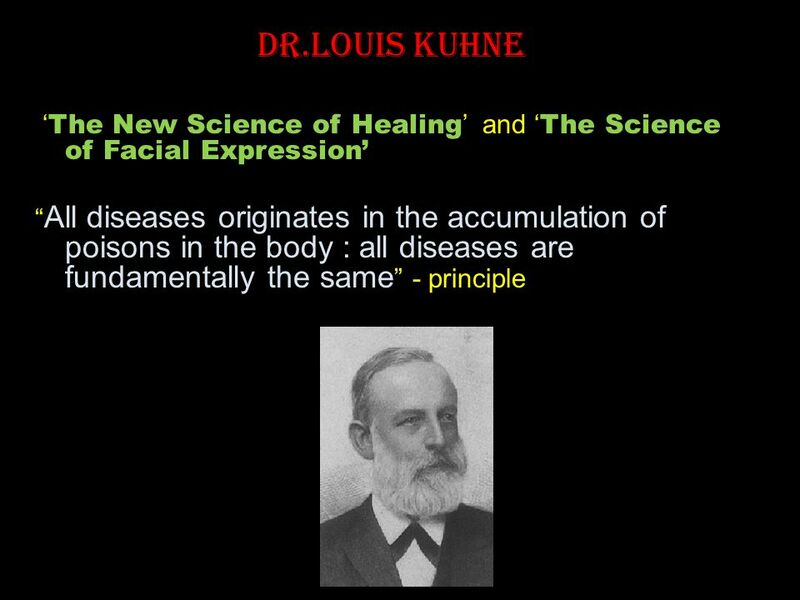 • Greek physician from Cos. • Recognised that disease was a disturbance of the balance of harmony within the body. 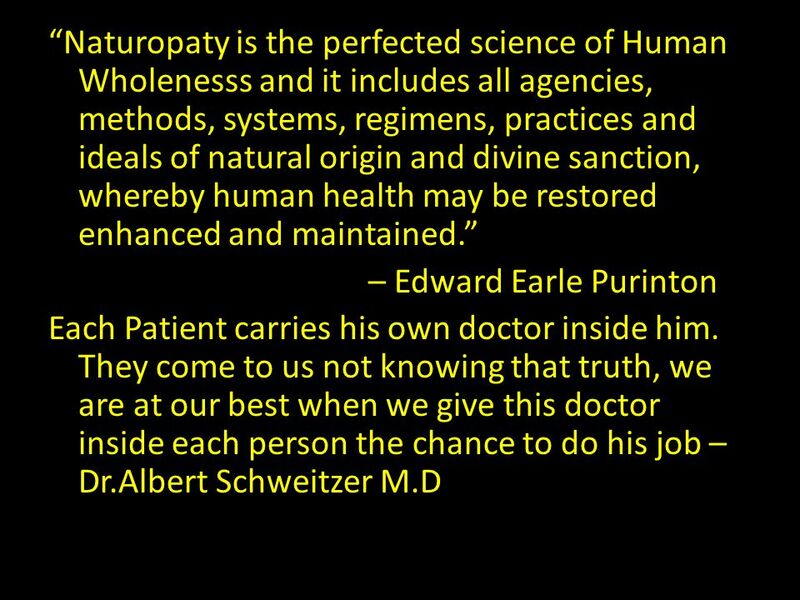 • A physician would restore this balance with the help of the patient. • He was the first healer to record medical experiences for future reference. 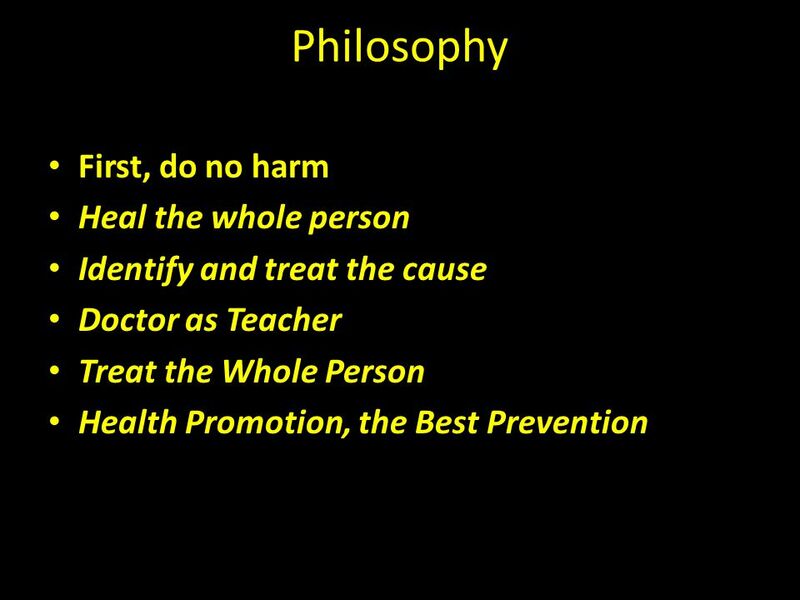 • The Hippocratic oath was exacted by his students. c300 BC The medical school and library of Alexandria is founded. 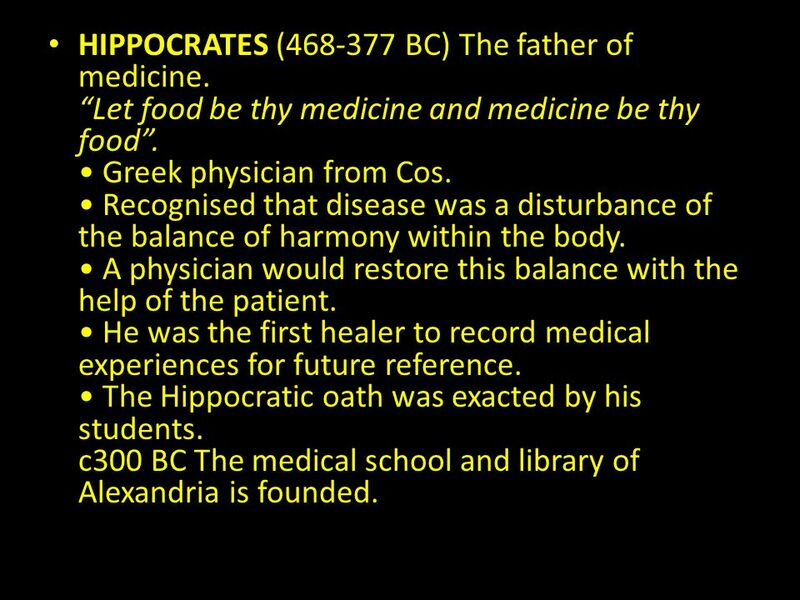 7 not of recent origin.originated 2500 years ago, at the time of Hippocrates.People regard Hippocrates as the father of modern medial science. This is a misconception. 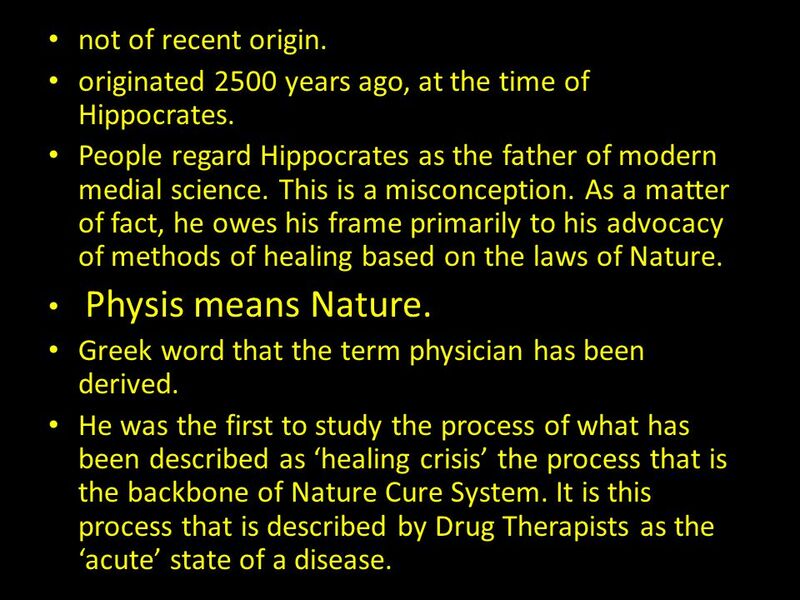 As a matter of fact, he owes his frame primarily to his advocacy of methods of healing based on the laws of Nature.Physis means Nature.Greek word that the term physician has been derived.He was the first to study the process of what has been described as ‘healing crisis’ the process that is the backbone of Nature Cure System. It is this process that is described by Drug Therapists as the ‘acute’ state of a disease. 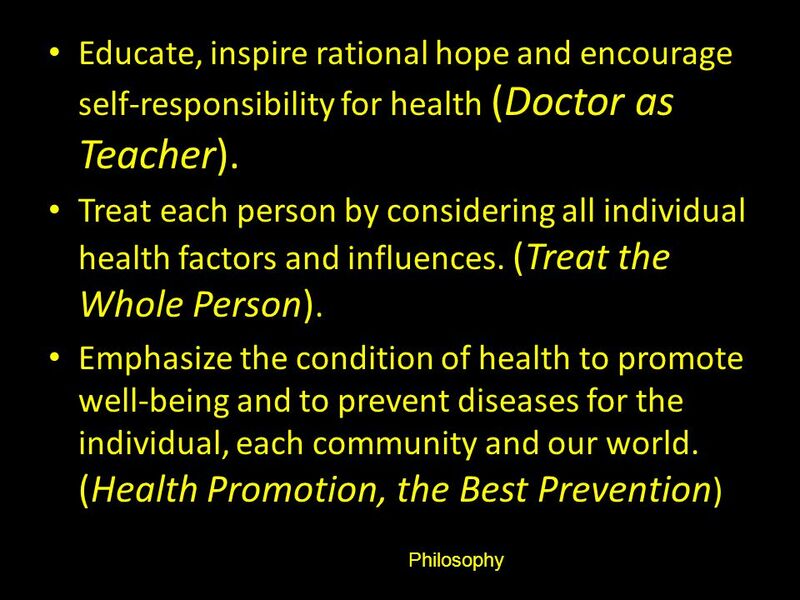 11 Educate, inspire rational hope and encourage self-responsibility for health (Doctor as Teacher). 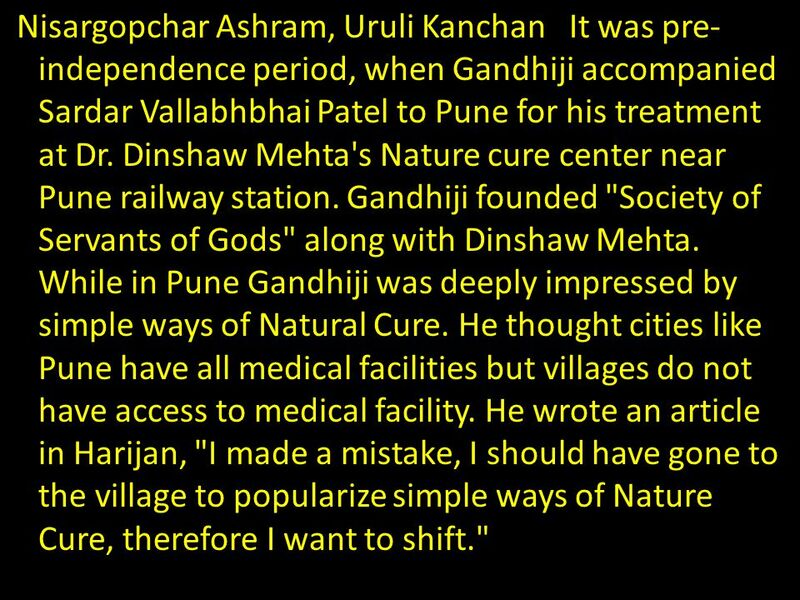 16 Nisargopchar Ashram, Uruli Kanchan It was pre-independence period, when Gandhiji accompanied Sardar Vallabhbhai Patel to Pune for his treatment at Dr. Dinshaw Mehta's Nature cure center near Pune railway station. 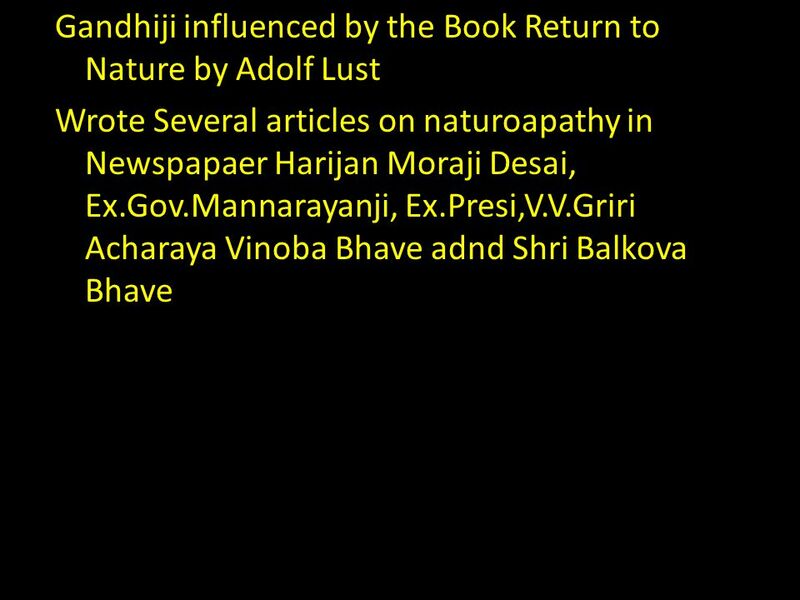 Gandhiji founded "Society of Servants of Gods" along with Dinshaw Mehta. 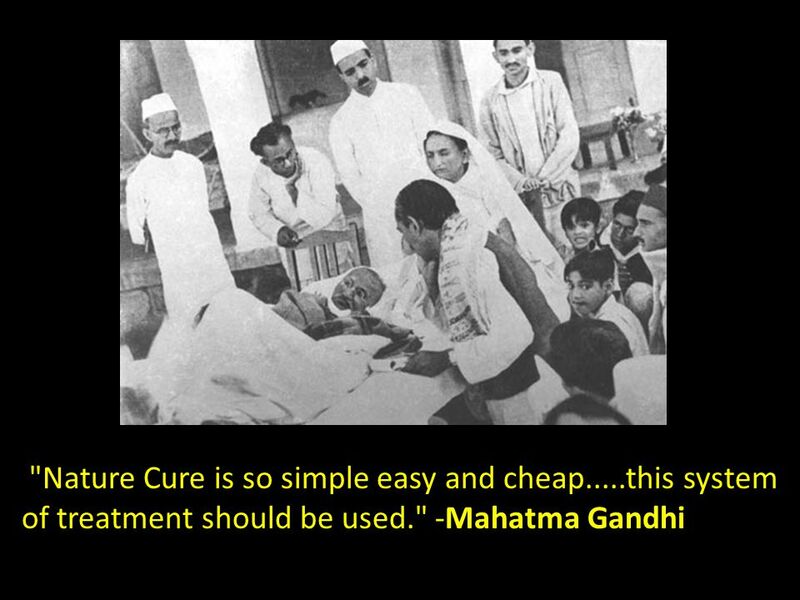 While in Pune Gandhiji was deeply impressed by simple ways of Natural Cure. He thought cities like Pune have all medical facilities but villages do not have access to medical facility. He wrote an article in Harijan, "I made a mistake, I should have gone to the village to popularize simple ways of Nature Cure, therefore I want to shift." 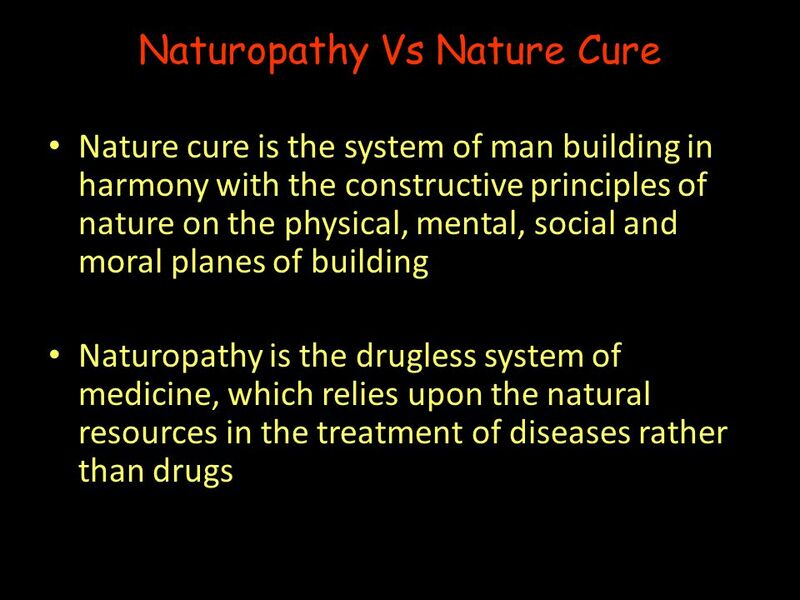 22 Naturopathy means a drugless, non-invasive, system of therapy involving the use of natural materials in its treatments based on the theory of vitality, the theory of toxemia, the theory of the self healing capacity of the body and the principles of healthy living. 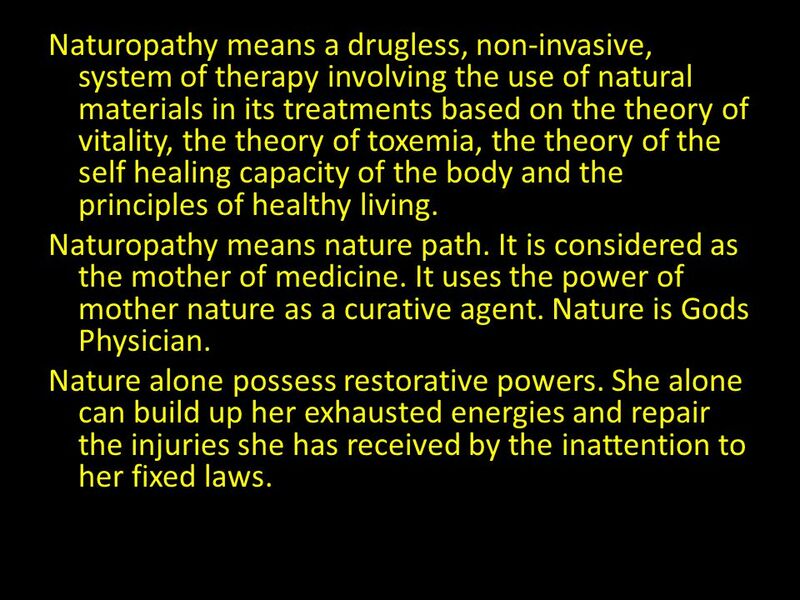 Naturopathy means nature path. It is considered as the mother of medicine. It uses the power of mother nature as a curative agent. Nature is Gods Physician. Nature alone possess restorative powers. She alone can build up her exhausted energies and repair the injuries she has received by the inattention to her fixed laws. 24 Dr. H.G. 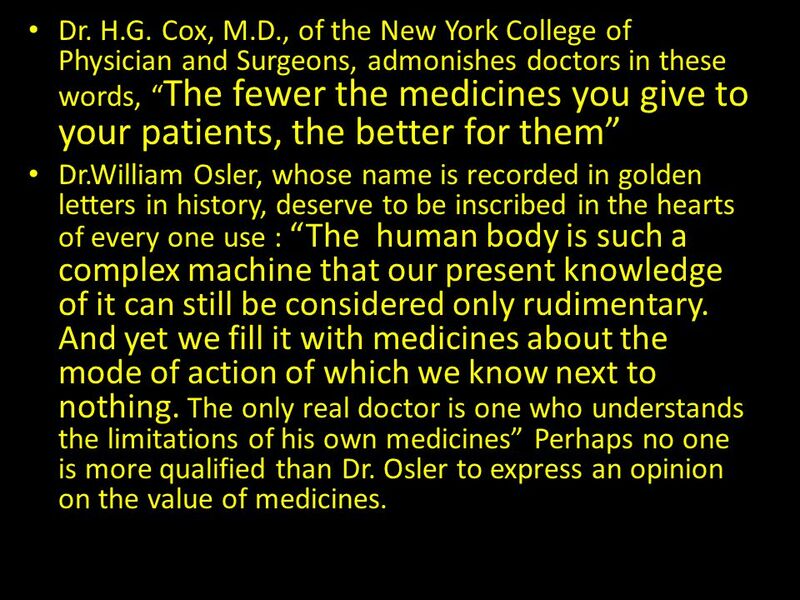 Cox, M.D., of the New York College of Physician and Surgeons, admonishes doctors in these words, “The fewer the medicines you give to your patients, the better for them”Dr.William Osler, whose name is recorded in golden letters in history, deserve to be inscribed in the hearts of every one use : “The human body is such a complex machine that our present knowledge of it can still be considered only rudimentary. And yet we fill it with medicines about the mode of action of which we know next to nothing. 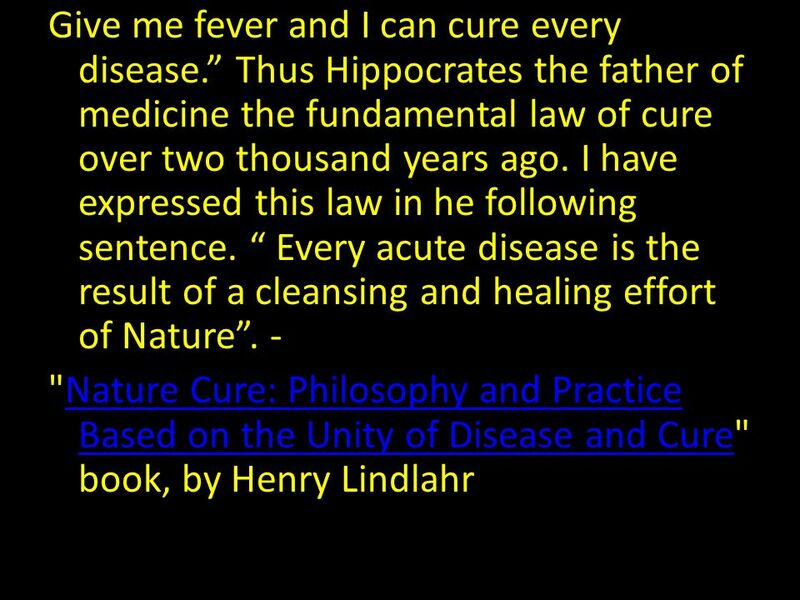 The only real doctor is one who understands the limitations of his own medicines” Perhaps no one is more qualified than Dr. Osler to express an opinion on the value of medicines. 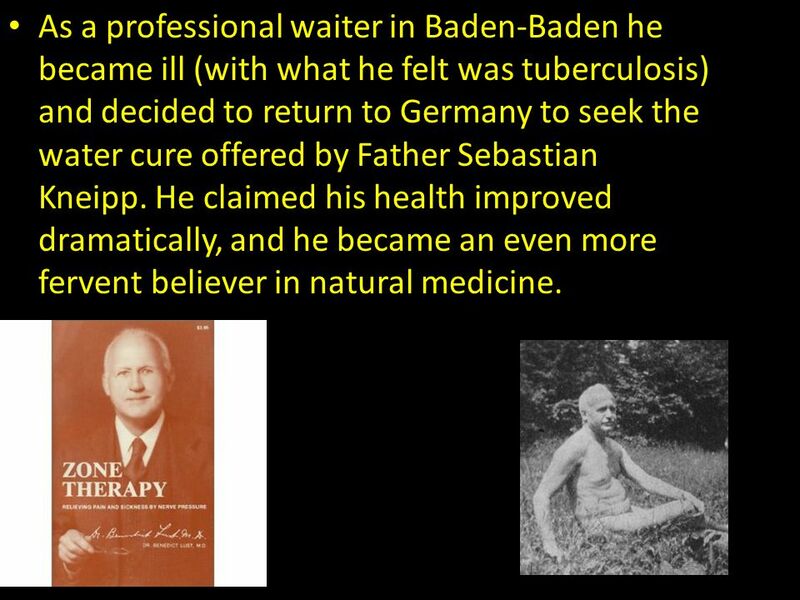 27 As a professional waiter in Baden-Baden he became ill (with what he felt was tuberculosis) and decided to return to Germany to seek the water cure offered by Father Sebastian Kneipp. 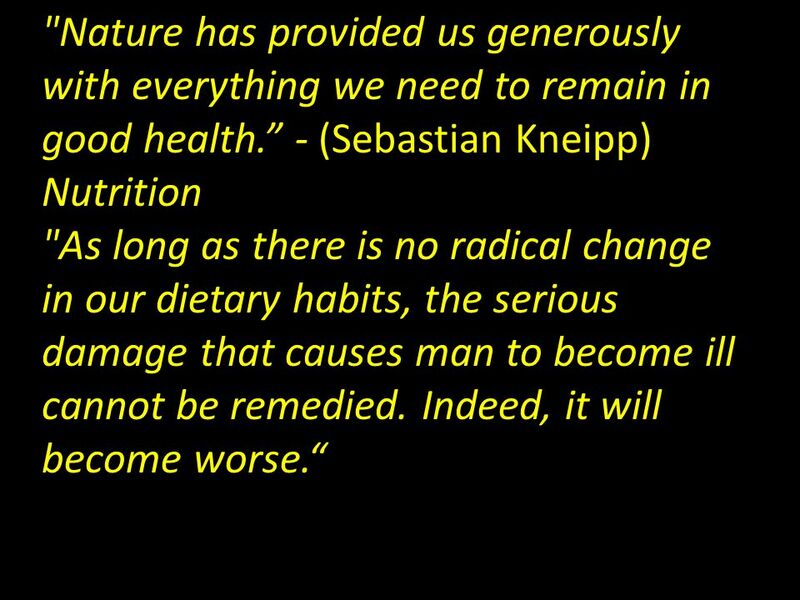 He claimed his health improved dramatically, and he became an even more fervent believer in natural medicine. 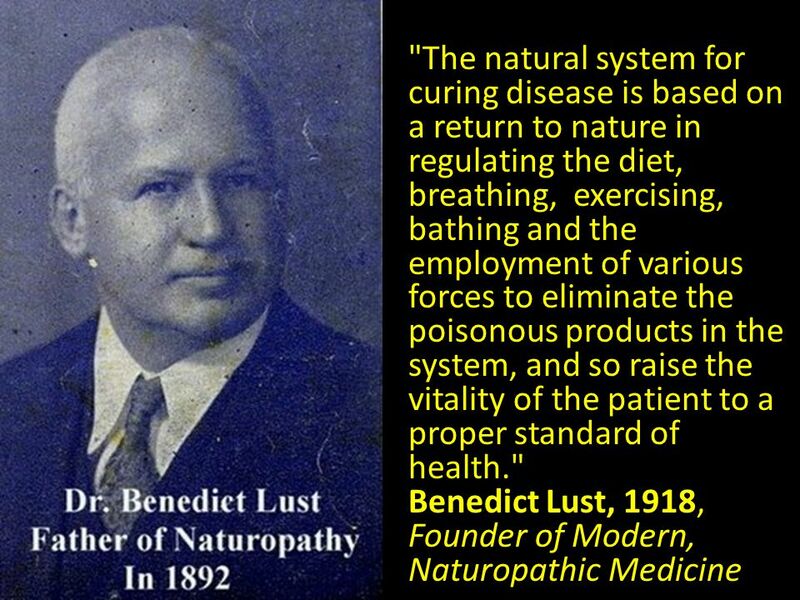 29 Benedict Lust began the Yungborn Nature Cure in 1896 on 60 acres in theRamapo Mountains near Butler, New Jersey. 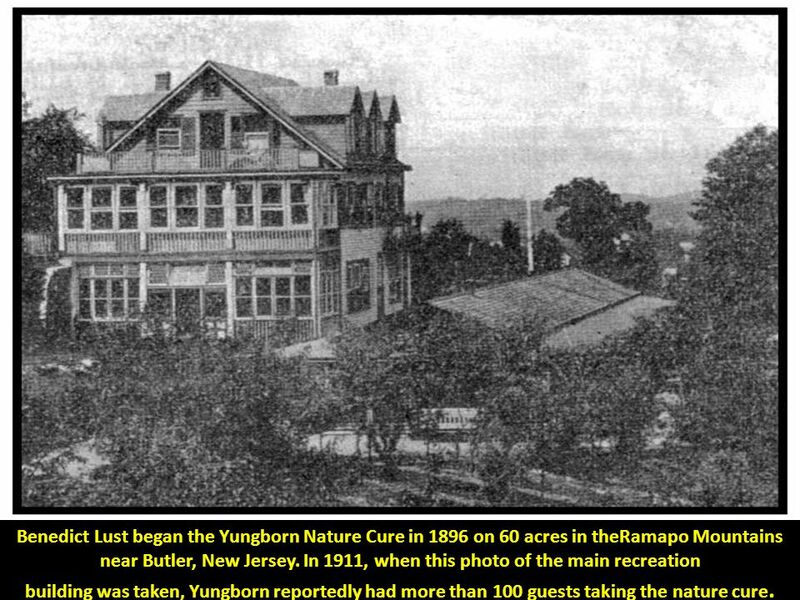 In 1911, when this photo of the main recreation building was taken, Yungborn reportedly had more than 100 guests taking the nature cure. 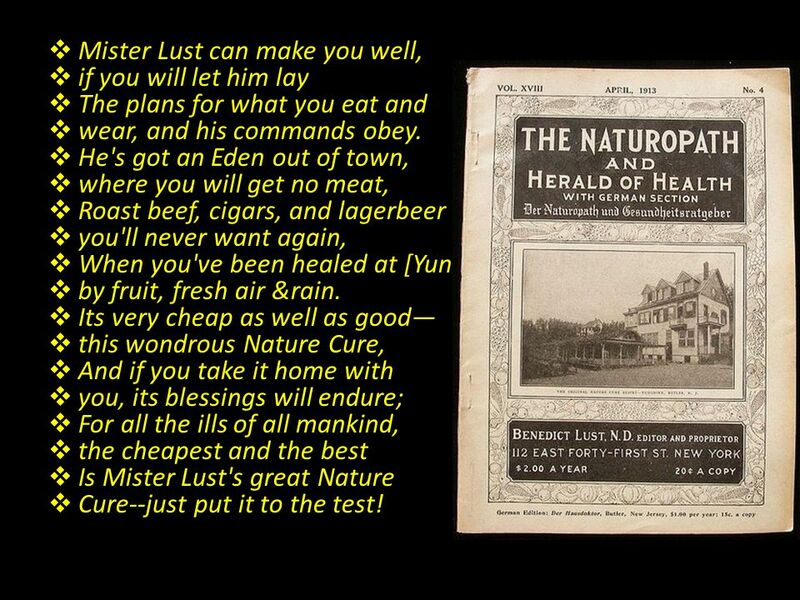 if you will let him layThe plans for what you eat andwear, and his commands obey.He's got an Eden out of town,where you will get no meat,Roast beef, cigars, and lagerbeeryou'll never want again,When you've been healed at [Yungborn],by fruit, fresh air &rain.Its very cheap as well as good—this wondrous Nature Cure,And if you take it home withyou, its blessings will endure;For all the ills of all mankind,the cheapest and the bestIs Mister Lust's great NatureCure--just put it to the test! 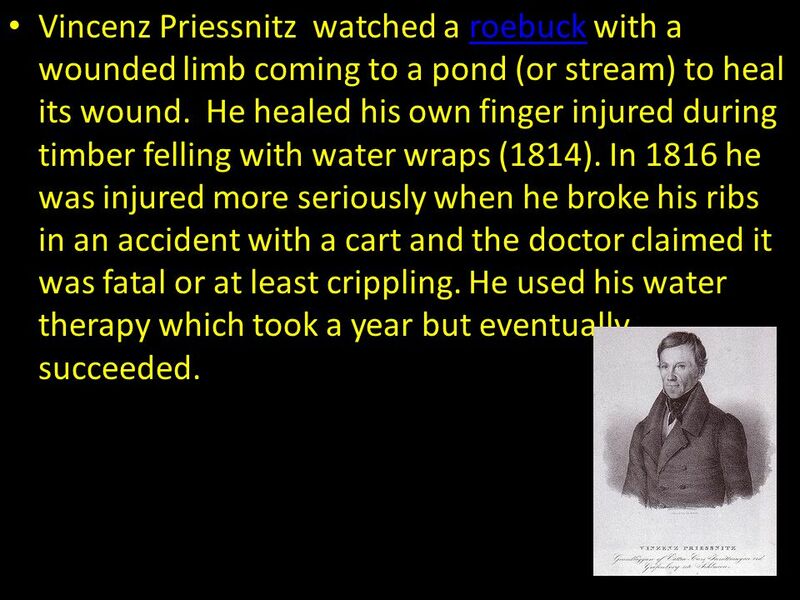 31 Vincenz Priessnitz watched a roebuck with a wounded limb coming to a pond (or stream) to heal its wound. He healed his own finger injured during timber felling with water wraps (1814). In 1816 he was injured more seriously when he broke his ribs in an accident with a cart and the doctor claimed it was fatal or at least crippling. 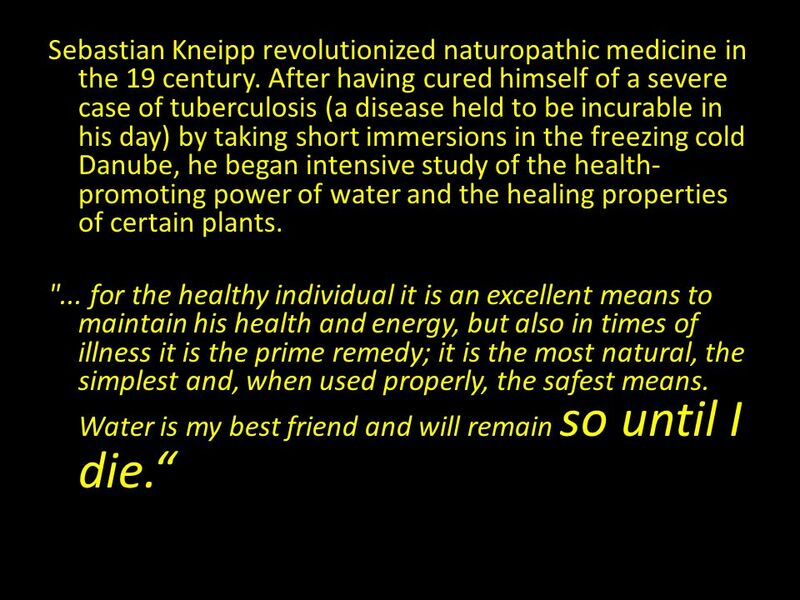 He used his water therapy which took a year but eventually succeeded. 32 Lázně Jeseník (until 1948 and in German Gräfenberg) is a small village in the Olomouc Region of the Czech Republic. 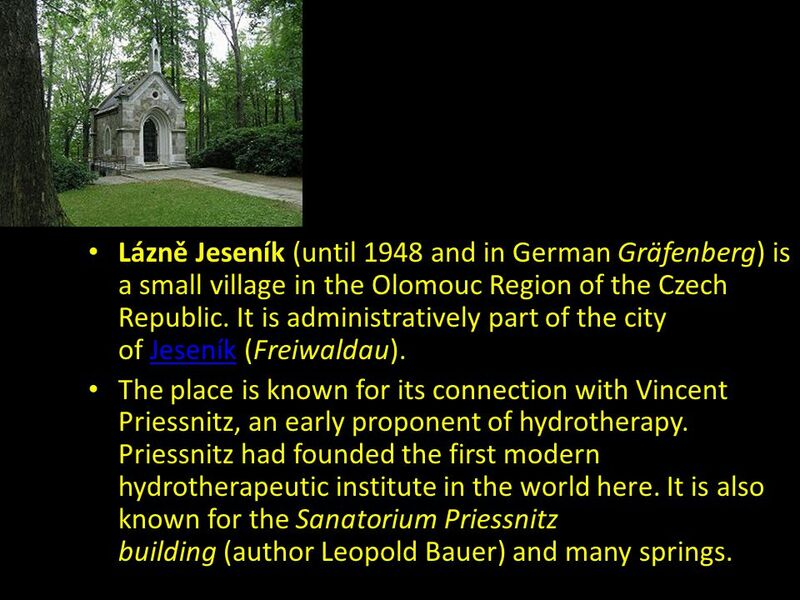 It is administratively part of the city of Jeseník (Freiwaldau).The place is known for its connection with Vincent Priessnitz, an early proponent of hydrotherapy. Priessnitz had founded the first modern hydrotherapeutic institute in the world here. It is also known for the Sanatorium Priessnitz building (author Leopold Bauer) and many springs. 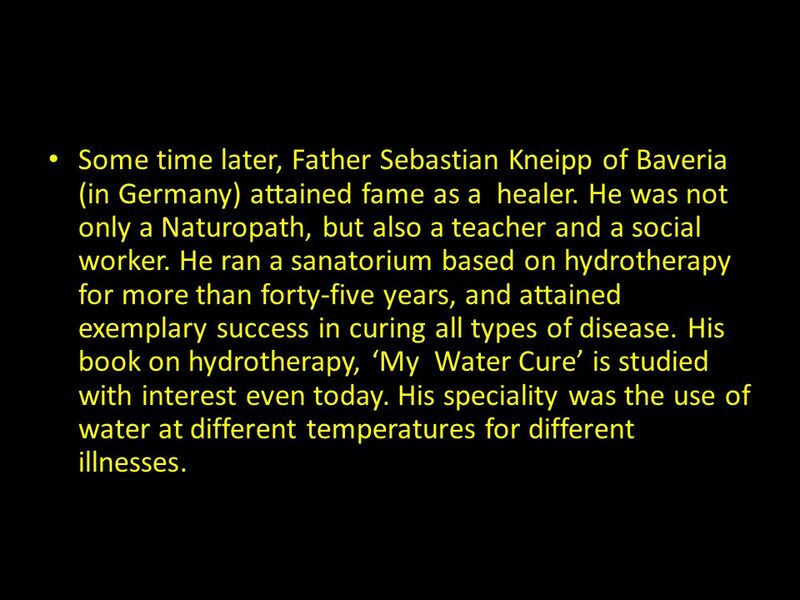 35 Some time later, Father Sebastian Kneipp of Baveria (in Germany) attained fame as a healer. 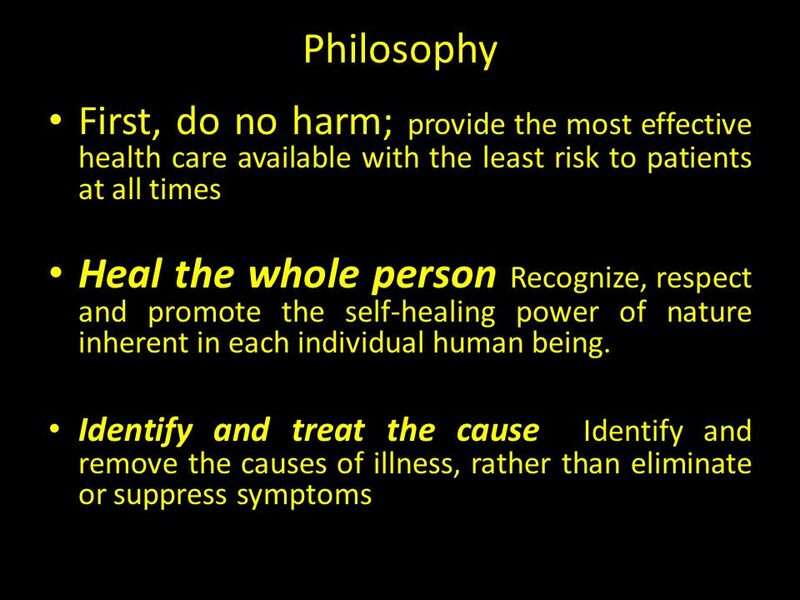 He was not only a Naturopath, but also a teacher and a social worker. 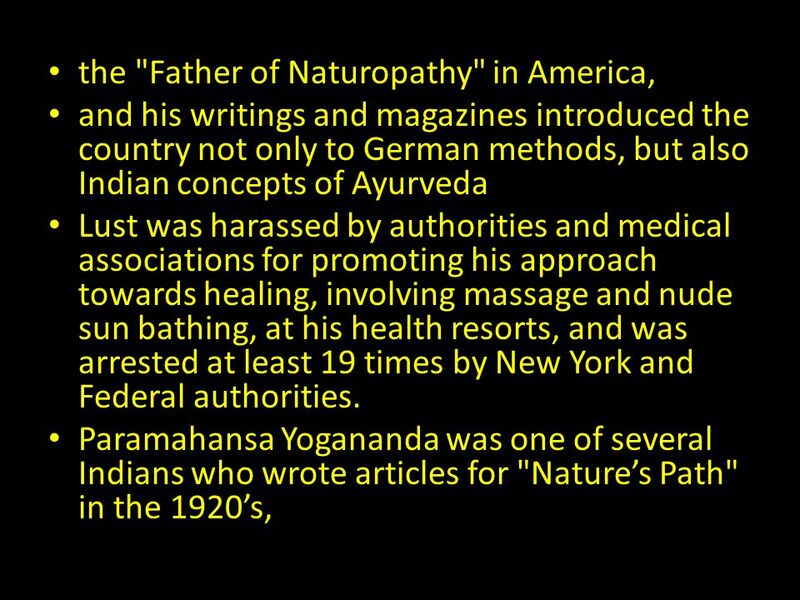 He ran a sanatorium based on hydrotherapy for more than forty-five years, and attained exemplary success in curing all types of disease. 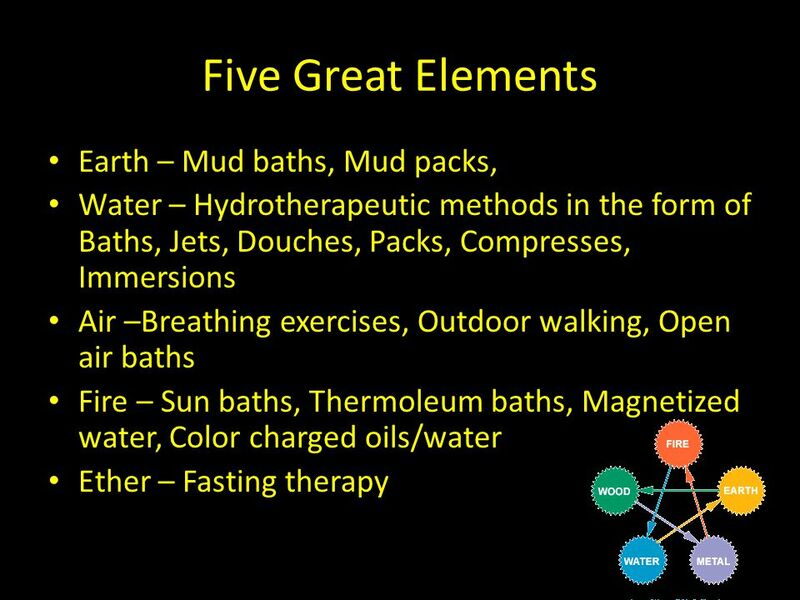 His book on hydrotherapy, ‘My Water Cure’ is studied with interest even today. His speciality was the use of water at different temperatures for different illnesses. 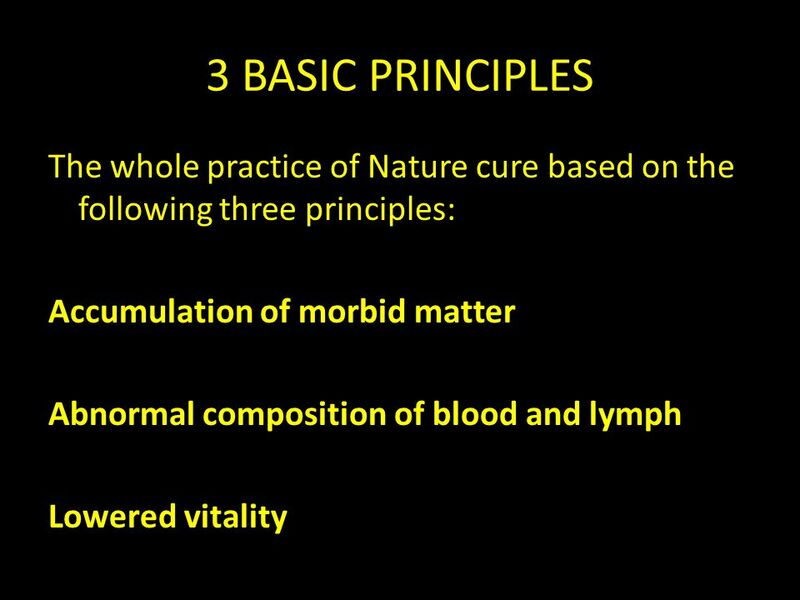 36 "With the correct combination of water and herbs, almost any illness can be cured." 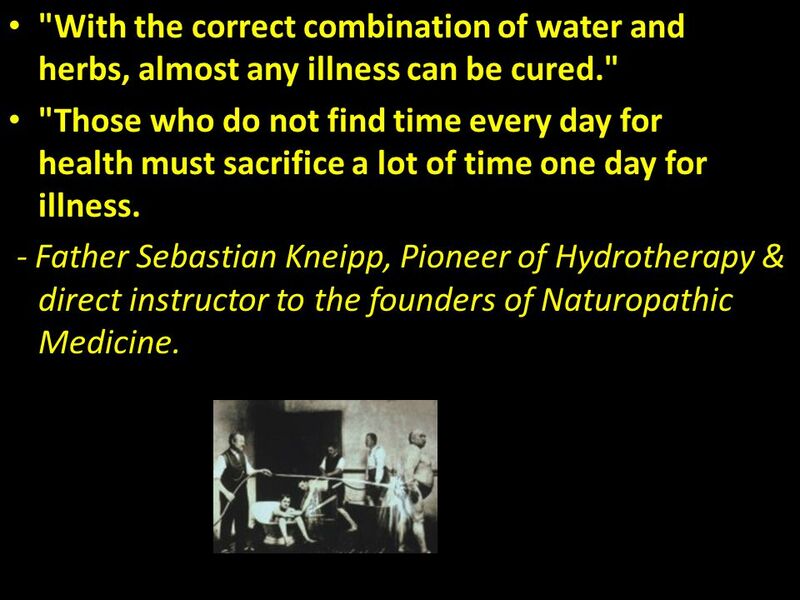 "Those who do not find time every day for health must sacrifice a lot of time one day for illness.- Father Sebastian Kneipp, Pioneer of Hydrotherapy & direct instructor to the founders of Naturopathic Medicine. 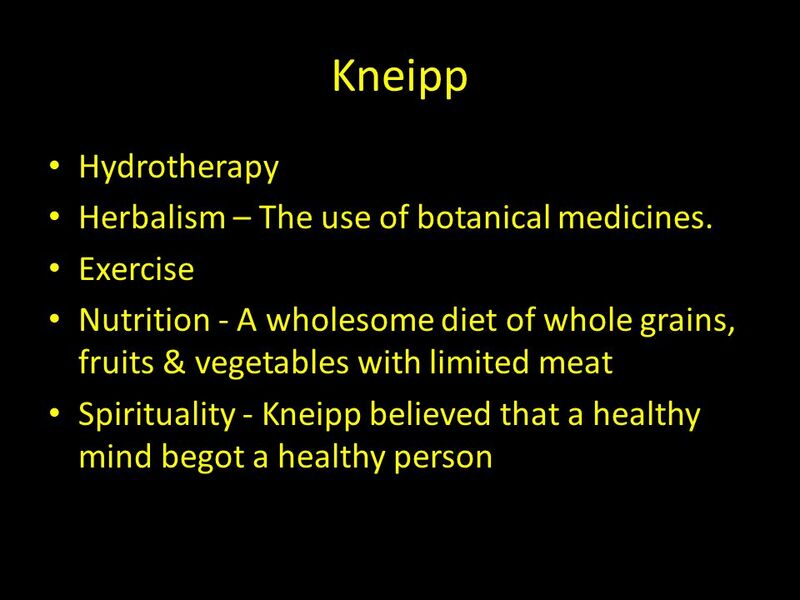 37 Kneipp Hydrotherapy Herbalism – The use of botanical medicines. 39 When submerged in water, your body is about one tenth of its normal weight. 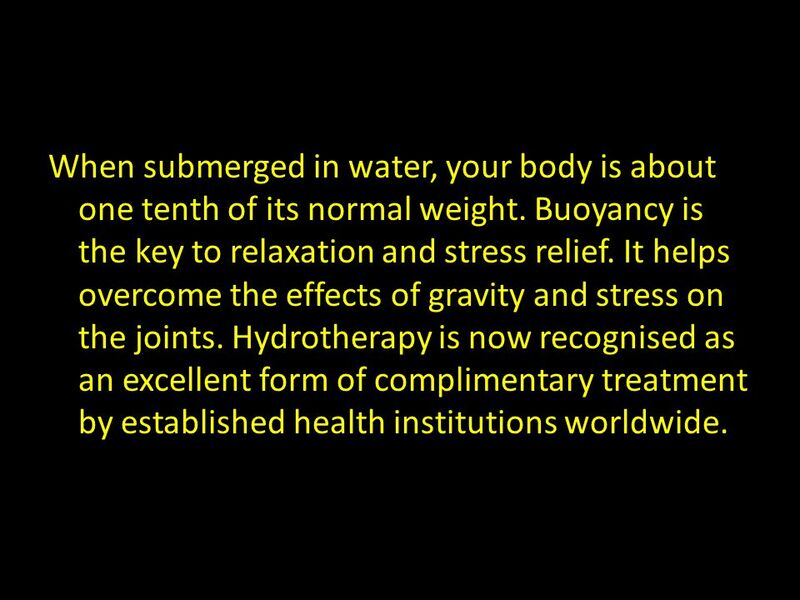 Buoyancy is the key to relaxation and stress relief. It helps overcome the effects of gravity and stress on the joints. 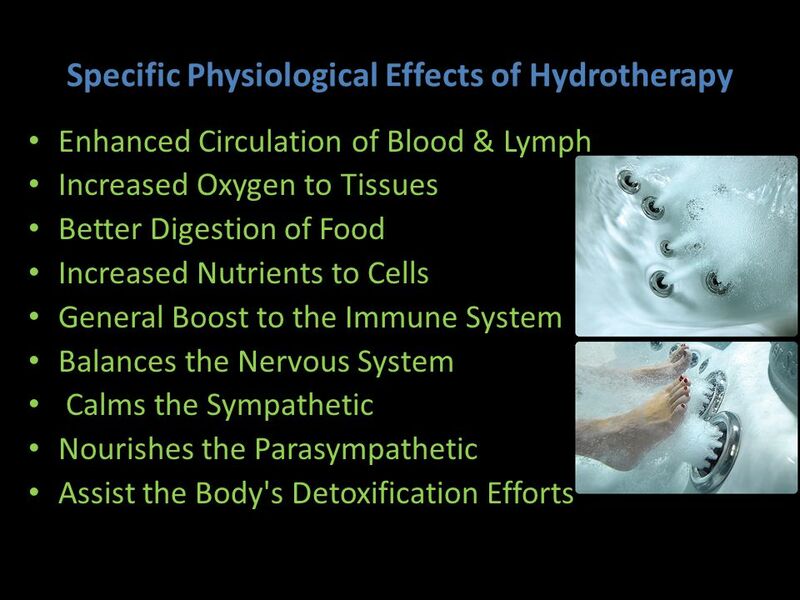 Hydrotherapy is now recognised as an excellent form of complimentary treatment by established health institutions worldwide. 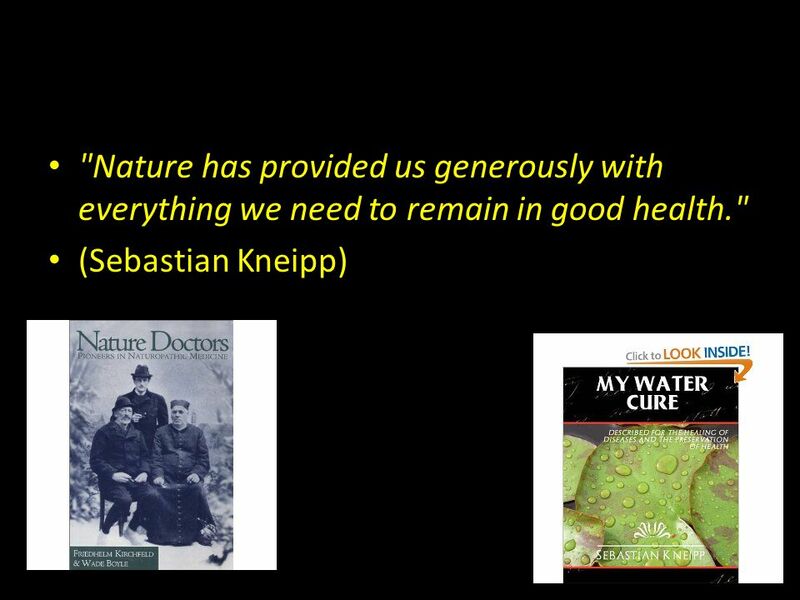 41 "Nature has provided us generously with everything we need to remain in good health." 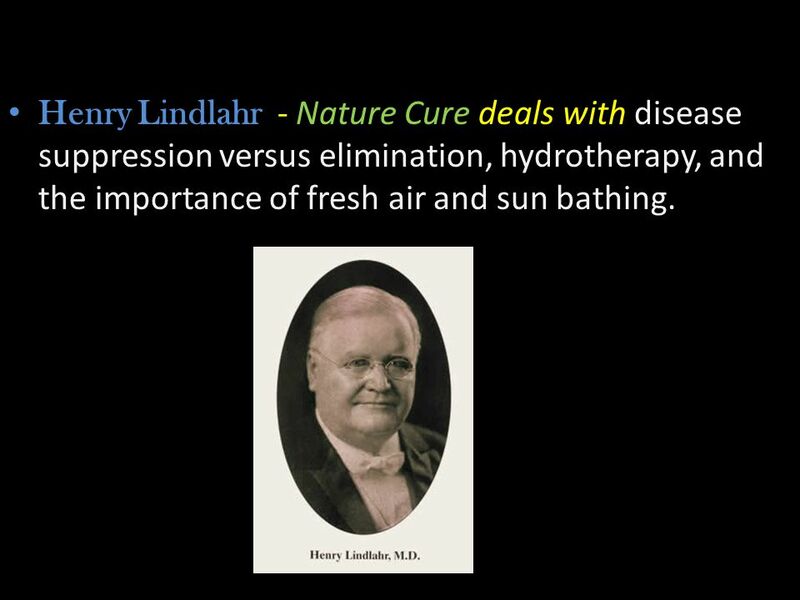 42 Henry Lindlahr - Nature Cure deals with disease suppression versus elimination, hydrotherapy, and the importance of fresh air and sun bathing. 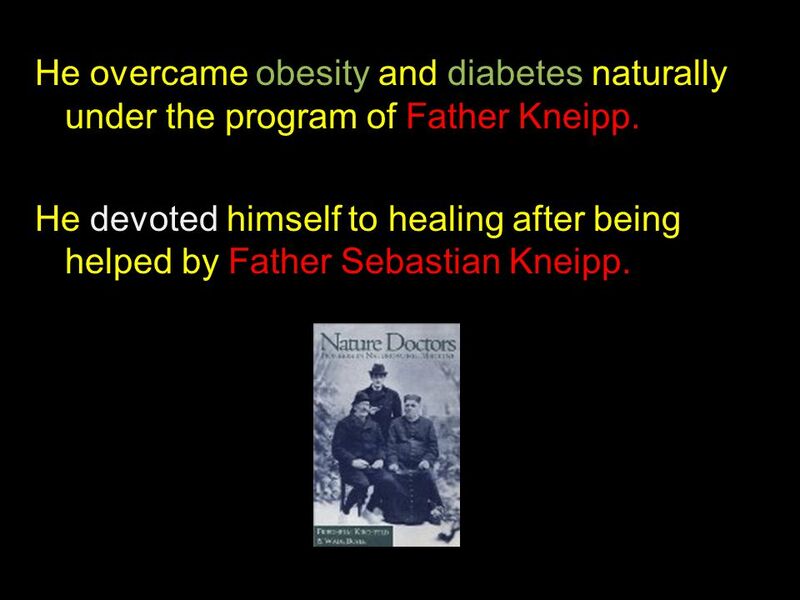 43 He overcame obesity and diabetes naturally under the program of Father Kneipp. He devoted himself to healing after being helped by Father Sebastian Kneipp. 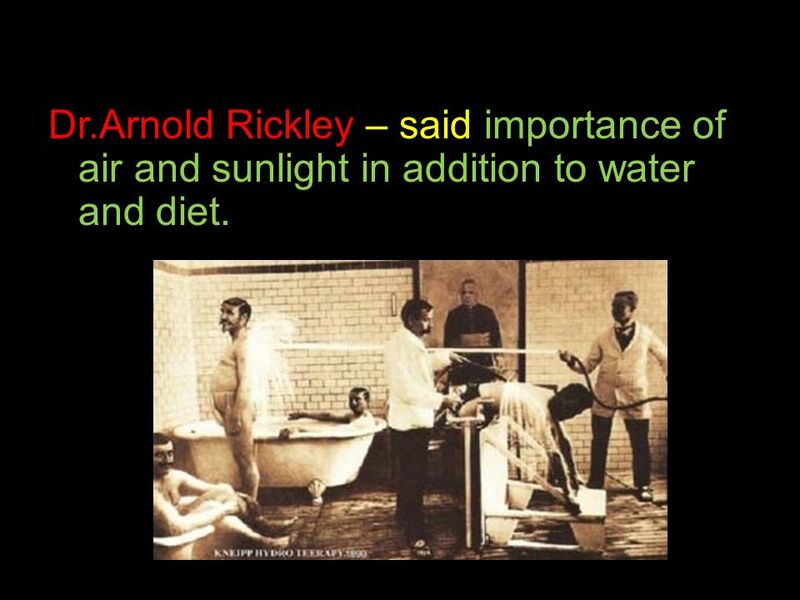 46 Dr.Arnold Rickley – said importance of air and sunlight in addition to water and diet. 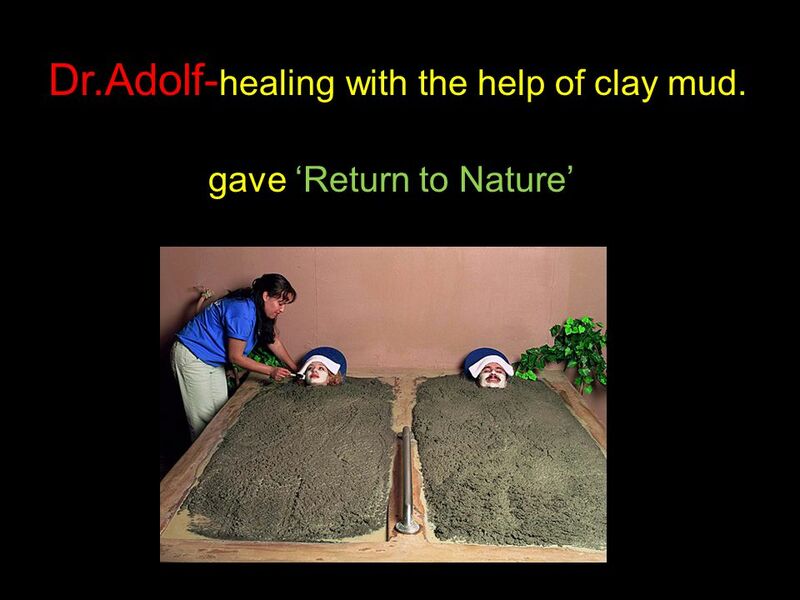 47 Dr.Adolf-healing with the help of clay mud. 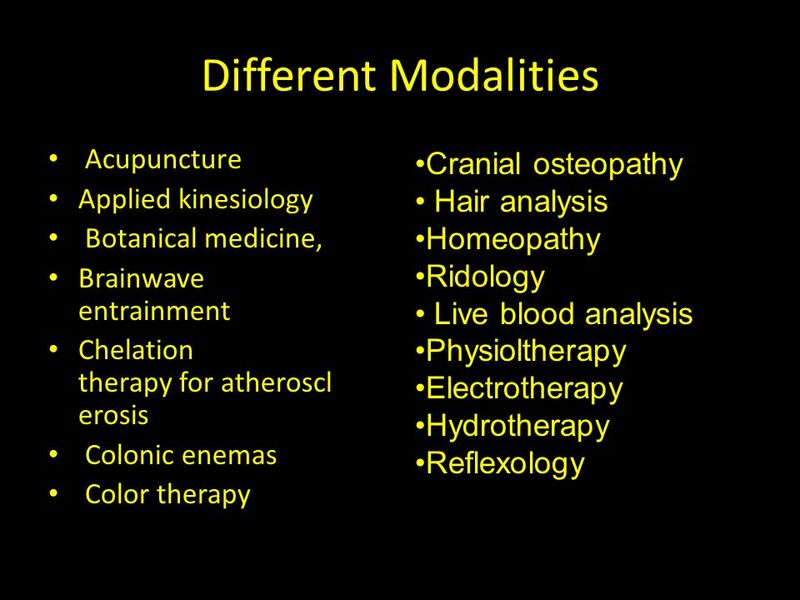 BOARD OF NATUROPATHY AND YOGA SYSTEMS OF MEDICINE (BNYSM) of Alternative Therapies & Yogic Sciences is one of the leading medical board providing education and health care services of truly global standards. A comprehensive range of general and super specialty medical services are provided here including complex treatments to authentic Complementary and Alternative Medicines experience. The institute focuses to deliver high quality, comprehensive, integrated medical education including innovative thoughts towards modern technology and research. We provide the finest in infrastructure and facilities to our students when it comes to learning and research along with experienced and dedicated faculty, outstanding clinical facilities, and a world-class environment that supports education. We offer different courses including Complementary and Alternative Medicines mainly Naturopathy, Yoga and many more. 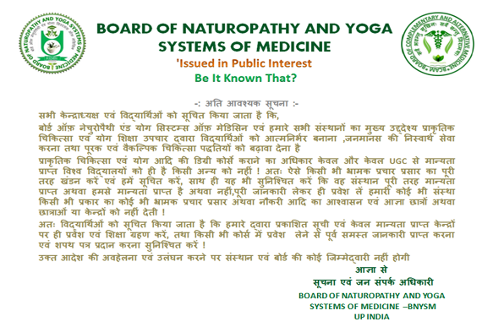 BOARD OF NATUROPATHY AND YOGA SYSTEMS OF MEDICINE (BNYSM) serve over thousands of patients annually through his affiliated institutes.. As a leading educational and health care organization BNYSM develops and maintains a spirit of charity and cooperation with the primary goal of improving patient safety and of promoting health in rural, urban and underserved communities. BNYSM wish to rise above the realm of therapeutic care with a new focus on preventive care, to bring health to the community. For the first time, an International Yoga Day will be celebrated on 21st of June this year. Prime MinisterNarendra Modi had suggested this honour for yoga and his suggestion got overwhelming support from 177 countries. Yoga has indeed become popular all over the world. Many millions practice it – from schoolchildren to senior citizens – and courses are held down to the village level in many countries of the west. But strangely, in its home country India, yoga was not valued even till a few decades ago. The reason was that under British colonial rule, Indian tradition was projected as worthless and Britain as the perfect role model. The credit for the revival of yoga in India goes mainly to Swami Ramdev. He established at the outskirts of Haridwar the biggest centre for yoga and ayurveda worldwide, called Patanjali Yogpeeth. Its size is stunning. It includes a yoga university, an ayurvedic hospital, a yoga hall of 25.000 sqm, thousand apartments for guests, conference halls, cafeterias, and several apartment blocks for permanent residents. Ramdev trained numerous yoga teachers there. He also travelled tirelessly through the country for several years teaching yoga and explaining its benefits to millions. Singlehandedly, he changed the negative image of yoga in India. Sat Bir S. Kalsa, an American Sikh from Harvard Medical School, brought to our notice what amazing acceptance yoga has gained in the west. “Yoga Nation” was the title on the cover of Life magazine, referring to USA. Time magazine followed suit with a cover story. The number of Hollywood stars who practice and praise yoga is continuously increasing. On the lawns of the White House in Washington, yogasanas were demonstrated. “And you know that yoga has finally arrived, when Mc Donald uses it for ads”, laughed Kalsa. Kalsa painted a grim picture of the state of teenagers in the US – violence, problems with social skills, bullying, attention deficit, binge drinking and suicide attempts are wide-spread. “They require assistance”, he claimed. Yoga in schools is the solution, Kalsa felt. Will India wait for foreigners to take the lead in putting yoga into the school curriculum? It was obvious that most western speakers considered yoga a wonderful ‘tool’ to work with – divorced, however, from its philosophy and yoga’s ultimate goal – to merge the small, temporary wave consciously into the big, eternal ocean. Some Indian delegates considered this a drawback or distortion. “Don’t you feel that by including yama and niyama (the virtues of external and internal purity) into yoga, the benefits would be greater?” an Indian delegate askedJohn Kepner, one of the founders of the International Association of Yoga Therapists (IAYT), who had just narrated that an US army officer had called him up, asking for qualified yoga teachers for the Armed Forces. “I don’t think the US army is interested in the traditional ways”, Kepner replied with a tinge of haughtiness. The lack of ethical grounding may be the reason behind the legion of yoga teachers for whom yoga is mainly a lucrative profession. IAYT has developed education standards for yoga therapists to follow. Yet IAYT, too, may not have the right motivation: they demand a costly affiliation from yoga centres if their students want to have the chance to become “certified” yoga therapists. So far, the west had a free run to appropriate Indian knowledge as India did not lay claim to it. In fact, India did not value it. “In the 1930s, under the British, yoga was not respected”, B.K.S. Iyengar narrated. 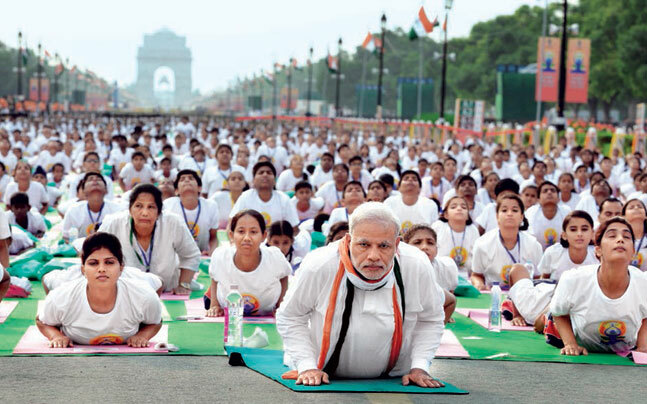 “I feel that only after yoga took roots in the west, Indians also opened up it,” he added. No doubt, Swami Ramdev is largely responsible for giving a tremendous boost to yoga in India. Swami Chidananda of Parmarth Ashram in Rishikesh remembered that in 1995, he sent a reporter to Swami Ramdev who at that time was teaching yoga in a small hall in Haridwar. “The reporter came back saying, that this was not newsworthy. Today, Swami Ramdev is THE news!” Swami Chidananda exclaimed. Swami Ramdev has his share of detractors as well. 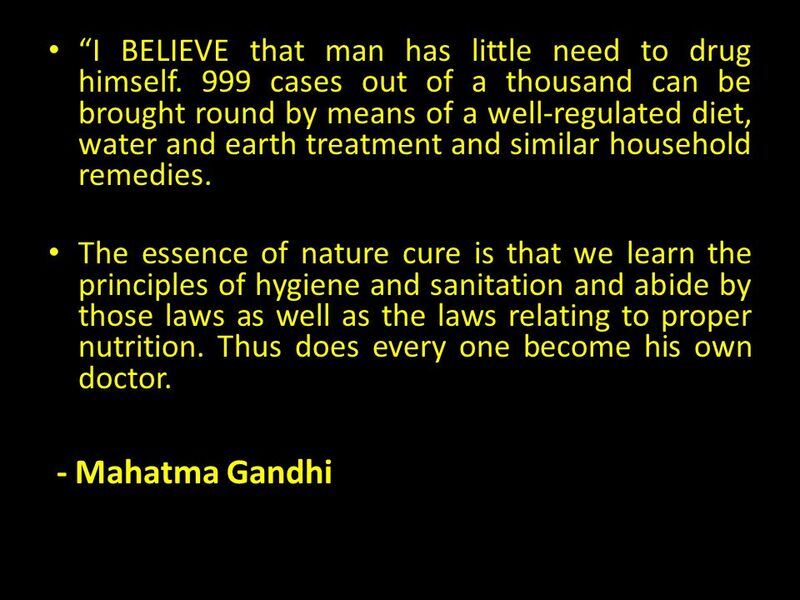 Many feel that his claim that yoga can cure 99 percent of all diseases is preposterous. “Big educated persons say, ‘Baba Ramdev is bad for people. He is misleading them.’ But what I say is the truth. I know it. I don’t tell lies. Those people are intelligent, but their mind is fixed.” Swami Ramdev looked like a small boy who is at a loss to understand how intelligent people are so confident in pronouncing judgment on something they have not experimented upon. 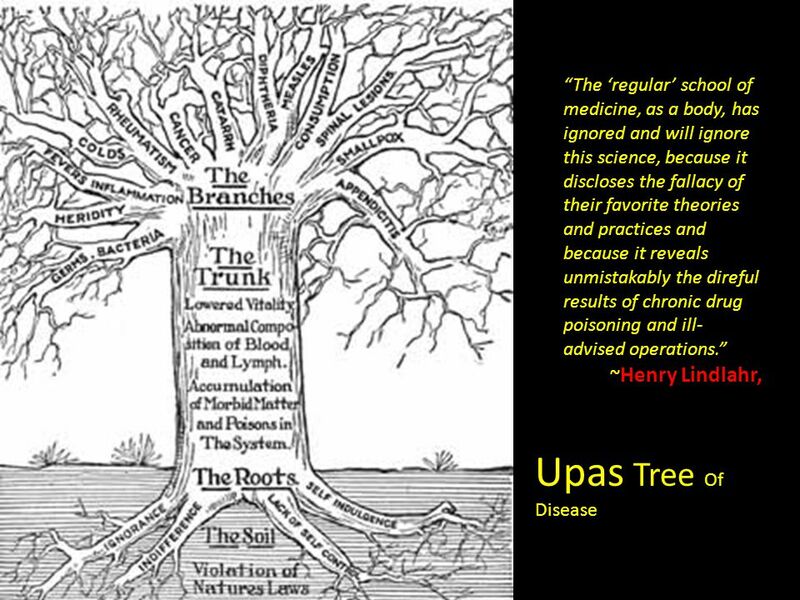 “In the Rig Veda is written that oxygen is the ultimate medicine”, he says. 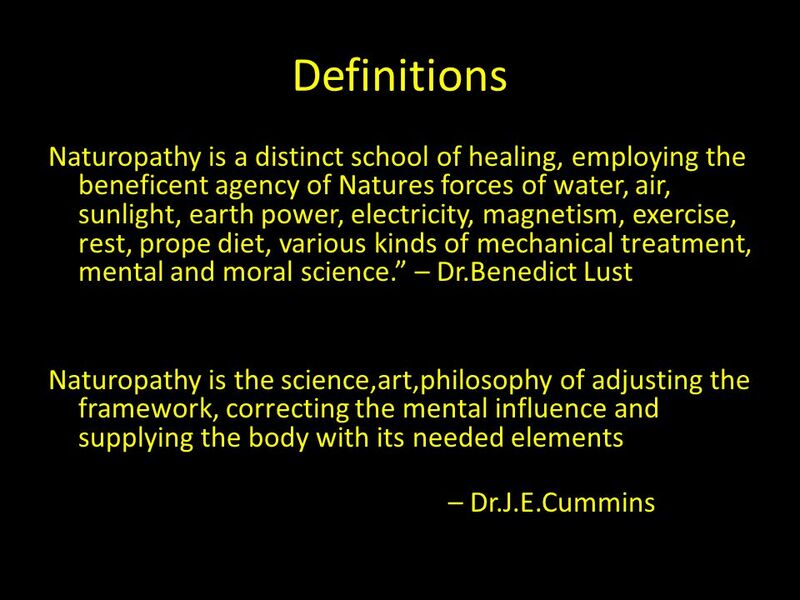 “It is not only the ultimate medicine, it is fire and fire is a synonym for knowledge, brightness, and light. Pran tatva is almighty, it is energy, it is the life force, it is God!” and he added, “disease will enter if the life force is weak. Make yoga your life partner and there won’t be life style diseases.” With amazing ease he quoted numerous Sanskrit shlokas to support whatever he claimed in his talks. Swami Ramdev has made yoga his life partner. He is an expert. Even his critics won’t deny this. Early in the morning, at a temperature of 5 degree Celsius, he taught yoga in the imposing 250.000 sq feet yoga bhavan to the delegates with only a cotton cloth wrapped around his hips. I was packed in several layers of woolens and still felt cold. “Whatever I have achieved has been given to me by kapalabhati and anulom vilom pranayam”, he claimed. “Partially, I have been able to attain that extraordinary power and that extraordinary knowledge that is within each one of us. I have felt what is eternal and real. Sages before me, too, have felt it. And I don’t say this to praise myself, but to give you an example. What Swami Ramdev has achieved in only 15 years – not only regarding yoga but also regarding a wide range of healthy swadeshi products – is mind-boggling. No doubt, extraordinary power and knowledge are at work through his person whose parents were illiterate farmers and who attended western type education only till 8th grade. In tune with the times, he spreads his knowledge through satellite TV and reaches millions all over the world. He never forgets to remind his audience that there is more to yoga than asanas and pranayama. Devotion and surrender to that great power within us (bhakti yoga) are most important for a yogic life. Devotion is the greatest unifier and the goal of yoga is union with that all-pervading divine Presence. Yet to be able to feel devotion one needs to learn and reflect on that great Presence (jnana yoga) and dedicate one’s actions to it (karma yoga). This combination of knowledge, love and action is the yoga that Sri Krishna taught Arjuna in the Bhagavad Gita 5000 years ago. Asanas and pranayama are helpful to purify and fine-tune the body and mind to become more transparent for the inner light. The west tends to ignore jnana, bhakti and karma yoga and focuses on becoming physically and mentally fit. This means, it may miss out on the great potential of yoga: to realize what we truly are. Swami Ramdev set the lively discussion on the flawed western view of yoga at rest: “even if you do only asanas and pranayama, you will slowly become a better human being”, he felt.